Marine litter is one of the most significant environmental problems affecting the marine environment. Around 20,000 tonnes of litter is dumped into the North Sea every year, affecting coastal communities, marine wildlife and the fishing industry. Plastic accounts for more than 50% of the items. Fish boxes, pots and gloves are the most frequently found items from the fishing industry. Plastic can cause entanglement or can be ingested by marine animals. Entanglement can cause horrific injuries and studies have shown that 95% of fulmars in the North Sea have plastics in their stomachs – on average of 33 pieces each. There is also an alarming prevalence of microscopic plastic particles 'microplastics' in our seas which can be taken up by filter feeders. Dumped catch, repairs to gear and lost fishing time due to marine litter costs each vessel in the Scottish fleet approximately £10,000 on average every year. Each vessel is calculated to lose 41 hours per year from removing marine litter from its nets – a significant amount of a boat’s time at sea allocation. It is therefore essential that continued action is taken to reduce what is a significant marine pollution problem. Clean seas are fundamental to the fishing industry and the industry recognises that they have a part to play in good stewardship of the oceans. Fishing for Litter is a simple idea. Participating vessels are given hardwearing bags to collect marine litter caught in nets during normal fishing activities. Full bags are deposited on the quayside in participating harbours and moved by harbour staff to a dedicated skip for disposal. The project provides the bags and covers the waste costs with the fishermen and harbour staff volunteering their time. The projects not only involve the direct removal of litter from the sea, but also work to raise awareness of the significance of the problem within the industry and beyond. Each project is a team effort with the fishermen, harbour masters and harbour staff supported by KIMO who work with national and local government, fishing organisations and industry to raise funds, coordinate the projects and raise awareness. Fishing for Litter is active in the seas around Great Britain, Scandinavia and Western Europe. One project, Fishing for Litter Scotland, will cost £96k for 2015/16, which covers 14 ports, 212 vessels and about 100 tonnes of litter. Current donors include Aberdeenshire Council, SNH, SFT, Marine Scotland, Seagreen, Peterhead Port Authority, Scrabster Harbour, Ullapool Harbour, Lerwick Harbour, TOTAL E&P, Tarbert Harbour, Crown Estate, FLTC, Beatrice Offshore Wind. The Fishing for Litter initiative has demonstrated its worth and expansion of the effort is now planned in the UK in Regional Action Plans and the Scottish Marine Litter Strategy. KIMO is working towards changing practices and culture within the fishing sector and beyond. It is providing a mechanism to remove marine litter from the sea and seabed and raising awareness among the fishing industry and society in general. One project, Fishing for Litter Scotland, has removed 800 tonnes of marine litter from the North Sea with 212 boats and 14 harbours participating. Fishing for Litter Scotland, has removed 800 tonnes of marine litter from the North Sea with 212 boats and 14 harbours participating. 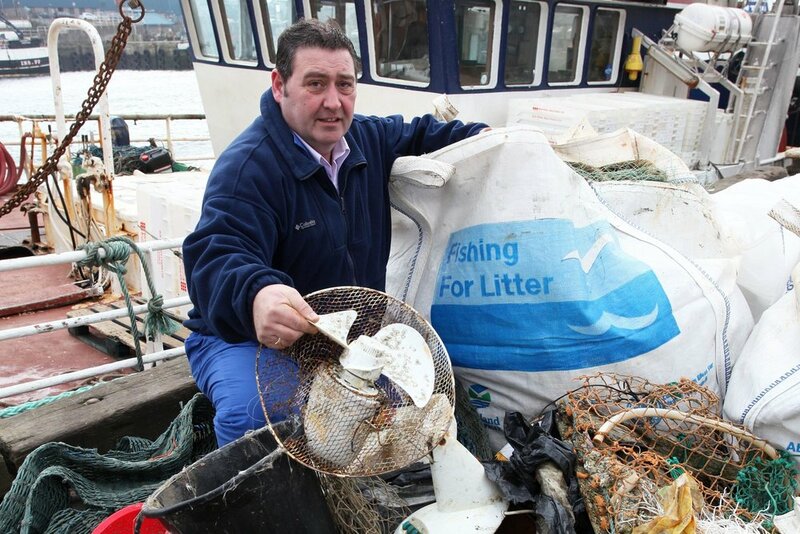 Fishing for Litter has demonstrated that it makes a real contribution to reducing marine litter. In an environment where ‘the polluter pays’, removing cost barriers to landing litter caught in fishing nets has encouraged fishermen and harbour authorities to volunteer their time and bring ashore litter that may otherwise have been returned to the sea. For example, waste brought ashore and taken to landfill is subject to ‘landfill tax’ which will shortly be charged at £82.60/tonne in Scotland – a bitter pill for fishermen bringing ashore another individual's litter. To ensure sustainability and expansion of the effort, ongoing mechanisms need to be found that do not assume that the person presenting waste from cleaning up is also the polluter. Central coordination at a country level is important to ensure a consistent and uniform approach nationally, taking account of local conditions. KIMO (Local Authorities International Environmental Organisation) is an association of coastal local authorities whose goal is to eliminate pollution from Northern Seas. The organisation’s members include 120 local authorities representing over 6 million coastal community inhabitants across Northern Europe.